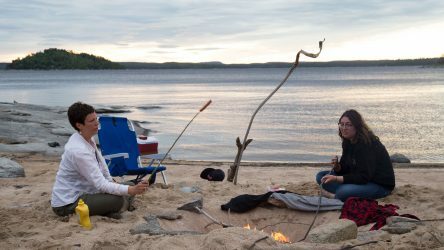 Students camping in the middle of Ball Lake Lodge: once a bustling fishing hub and key employer for Grassy Narrows. 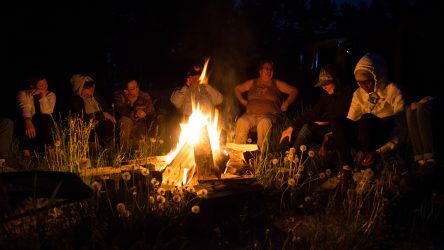 The lodge was closed following the discovery of mercury in the English-Wabigoon river system, leading to a dramatic rise in unemployment in the community. 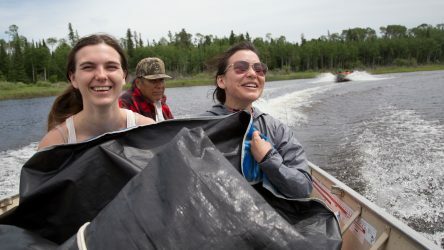 Last month, 22 University of Manitoba students took part in a two-week program that situated them directly in the context of the Anishinaabe of Northenwestern Ontario to develop an understanding of their place as “treaty” people by engaging in the environmental and cultural politics of Grassy Narrows First Nation, also known as Asubpeeschoseewagong. Some 89 kilometres northeast of Kenora, on the English-Wabigoon river system, Grassy Narrows is one of 28 first nation communities under Treaty 3, which covers more than 140,000 square kilometres in Northwestern Ontario and eastern Manitoba. The community continues to experience the impacts of Canada’s colonial foundations – enduring over one hundred years of dispossession in their homeland and dishonouring of treaty rights through persistent resilience, determination, and courage. Barbra Fobister, prominent activist in the logging blockade, shares stories and lessons learned during her days spent at the blockade. Grassy Narrows lies within the “land of 10,000 lakes” and is home to the longest running Indigenous logging blockade in Canadian history, stretching back to December, 2002. In 2014, the Supreme Court of Canada upheld the Ontario government’s right to permit logging on Grassy Narrows’ traditional land. The case, brought to the Supreme Court by the people of Grassy Narrows, sought to defend their traditional lands from logging in conjunction with the blockade. Nearly 15 years after it began, the blockade is ongoing and it continues to be an ode to the fortitude of the people of Grassy Narrows. The “Grassy Narrows Environmental and Cultural Politics” program is a six credit hour summer course delivered through the department of native studies. 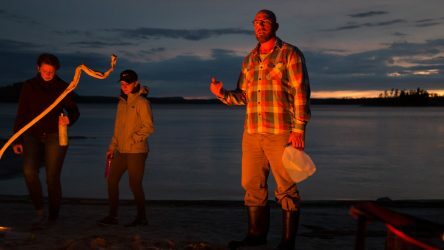 The travel-study course, created by instructor Ryan Duplassie, attempts to provide a holistic approach in exploring the cultural and environmental politics affecting Grassy Narrows. “Since my late teens I became really interested and concerned about environmental issues,” Duplassie said. Explaining that “we are all treaty people,” Duplassie said Indigenous understandings of the treaty go beyond political contracts. “They extend to a commemoration of our understanding of ourselves as embedded in the world in the set of relationships with the water, the insects, the soil, the fish, the fire, the wind, the sun, the moon, our ancestors, and our future generations,” he said. Students were asked to attune themselves to the boreal environment and consider the importance and continued relevance of Indigenous knowledge in today’s world. Reflecting on her experience, Jenna Vandal cited the course’s unconventional teaching style as one of the reasons for her interest. “I much prefer learning outdoors than in a classroom, especially when in relation to Indigenous knowledge and ways of being, so I jumped at this opportunity,” she said. The course consists of a three-day lecture series on campus where the class learns about the history of Grassy Narrows – from the signing of Treaty 3 up to the blockade. This is followed by 10 days of camping at Grassy Narrows where students experienced living off the land. Students then write four assignments which include reflective essays and a report. A typical day would end with new friends by the fire. “Every single person involved in this course was fantastic and committed to positive social change in their own unique way,” Vandal said. Between 1962 and 1970, a pulp mill located in Dryden dumped 10 tonnes of mercury, a potent neurotoxin, into the Wabigoon River, contaminating fish stocks and poisoning generations of people for whom the river’s fish provided a staple source of protein. First identified in 1969, the mercury has never been cleaned up. Nearly five decades later, the impacts of mercury poisoning are still omnipresent; it is estimated that there are 9,000 kg of mercury in the river’s sediments. Recent studies have found that 90 per cent of people tested in Grassy Narrows and nearby Indigenous communities have symptoms of mercury poisoning. A Mercury Disability Board was set up in the 1980s following a court settlement, though the compensation levels – which range from $250 to $800 – have not increased since that time. The mercury poisoning had a direct impact on the community’s traditional way of life as many continue to suffer the neurological symptoms of mercury poisoning – even people born long after the mercury dumping had ended. Symptoms include sensory disturbances on the limbs, difficulty walking a straight line, difficulty seeing, visual disturbances, hearing impairment, headaches, insomnia, exhaustion, fatigue, and numbness in the limbs. 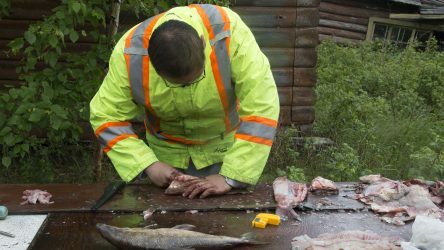 A fishing guide from Grassy Narrows First Nations teaches students traditional methods of preparing and smoking fish. 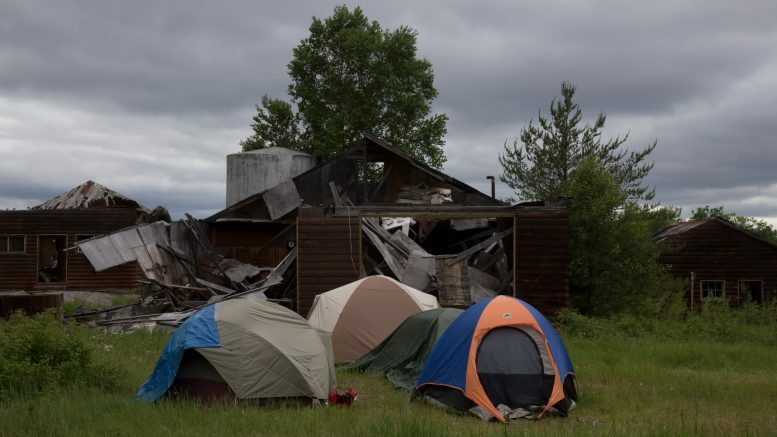 “Of course when you’re talking about a land-based people who are traditionally going to be on the land fishing, hunting, trapping, gathering and you have neurological symptoms of mercury poisoning, well, you can’t do those things,” said Duplassie. 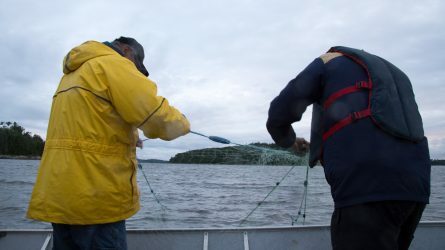 While at Grassy Narrows, students learned to set nets, ate fish, and drank from the water. “It is an opportunity for the students to figuratively and literally internalize the implications around mercury poisoning,” Duplassie said. Vandal reflected on her experience fishing and eating from the contaminated river, explaining how drawing from the land connected her with the community. “This was a surprisingly healing experience,” she said. “I knew I was ingesting a minute amount of mercury in the water I drank, and in the freshly caught fish we ate, but to me it was a symbolic gesture of becoming closer with the land and the plight of the people who have endured so much more. “I was internalizing only a small fraction of the neurotoxin that the community was, but I was also internalizing centuries worth of tradition, sustenance, and pride. In late June, it was announced that the government of Ontario would spend $85 million to clean up the mercury contamination around Grassy Narrows. Clean-up preparation work will be completed this summer, with remediation starting as early as 2018. An additional $2.7 million has already been set aside to accelerate work underway on the river. Calling it too little too late, Duplassie gave a glass half empty versus glass half full analysis. He said that while $85 million is a substantial figure, the river system serving Grassy Narrows is nearly the size of a water shed. Additionally, as Duplassie explained, as water flows, the affected sediments move. This means that the mercury is a moving target. Problems therefore arise when determining where best to start and end the clean-up. Instructor, Ryan Duplassie (far right) teaching students what it means to be a “treaty” person. However, the positive side, quite simply, is that something is being done. Duplassie explained that whatever the results of the clean up might be, he hopes it will involve the community members of Grassy Narrows through proper training and employment opportunities. “I kind of see this as an economic opportunity, as sad as that is,” he said. Reid Buchanan, another student who took in the course, spoke to the impact the course had on him. “The knowledge and the experience with the people as a whole has been kind of invaluable to me and having a personal connection there, I think, can help solidify a lot of things that you learn about,” he said. Reid Buchanan taking in a fishing net with the help of Shoon – local fishing guide, story-teller, and respected community member. “It’s important that issues stay at the forefront and that we maintain connection. Its not just land and culture, this is people,” Buchanan added. “And this is people who are emotionally, culturally and economically invested in their community and we need to do what we can to help them. Duplassie echoed that there is always place for hope. “Yes, climate change is real,” he said. “Yes, our water and land and air systems are becoming polluted. Yes, there is deforestation and erosion and desertification and acidification of the oceans and melting polar ice caps, yes – but we’re alive. Students were given plenty of time to explore the surrounding area, and reflect on their relationship and responsibility to the land, water, and community.